This is a set of 13 individual files to use in your classroom and teacher resource files that you sell and distribute. 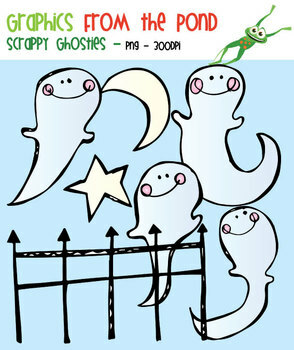 The set includes 4 different ghosts, a fence, moon and star. They CANNOT be shared or distributed as image/clipart files for any reason. You cannot make your own clipart/image files with out clipart files for any reason. You must create something with them where the images are embedded.